Diemaking Supplies – Other – AmeriKen Online! Add a rule support, on-press, in minutes! With the H7 rule support system you can quickly and easily repair bent lead edge knives, slots, or any rule on either flat or rotary dieboard before, during, or after presstime. The H7 can can be used on press without removing the die, reducing downtime and saving money. Using the system after a press run to reinforce weakened spots will extend the life of the die for future use. To see a demonstration of the H7 system, click here or to see a detailed description, click here. Fits standard holes, justs drill and drive for installing. Round edges along slot prevent scored holes. Self-locking spring action is built-in locking mechanism. Reusable, lightweight, yet strong. Chamfered ends start easily. Available in 5 diameters: 3/32″, 1/8″, 3/16″, 1/4″, and 3/8″, all 2″ long. Other lengths available on request. Size: 1/4″ x 2″ long. 1,000 per box. 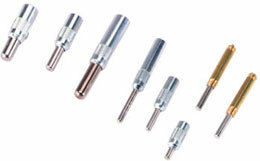 We also carry Bobst stripping pins. For close tolerance die. 1/2″ diameter, in heights .900 to .960. Other heights and diameters available on special order. Two tolerances available +/-.001 or +/-.0005. Materials slide over radius corners much easier than typical chamfered tops. High tolerance pins provide accurate locating. Easily identify correct pin with our unique marking sytem. Kevlar gloves available in open fingertip or closed finger style. The PVC dots add extra non-slip gripping power. Made from Dupont Kevlar fibers similar to bulletproof vest material. These gloves are lightweight, comfortable, and provide excellent cut prevention. Heavy duty leather bundling gloves available in right or left hand. Round base with 3 staight prongs. Available in a large selection of decimal and metric sizes. Available in matte frost on one side, both sides, or clear. Comes 12 in a box. Available individually or in 4 & 7-Piece Boxed Sets. These German made 3-1/2″ long bits have such superior engineering that they are patented. Their chip groove shape allows higher boring speeds, with less boring head friction. They have two cutting edges with unique outer rims for cleaner cutting without deflection by grain or knots. Can be used with any portable or stationary drill with 3/8″ or 5/16″ chuck capacity. 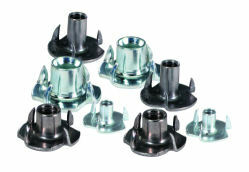 Available in diameters from 3/16″ to 2″ (in 1/16″ increments). All in stock and ready for immediate shipment Larger size diameters available as a special order. 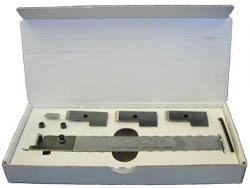 4-Piece Set comes with 5/8″, 3/4″, 7/8″ and 1″ diameter bits. 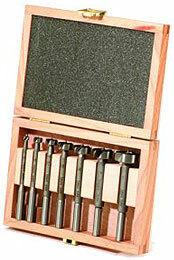 7-Piece Set comes with 1/4″, 3/8″, 1/2″, 5/8″, 3/4″, 7/8″, and 1″ diameter bits.